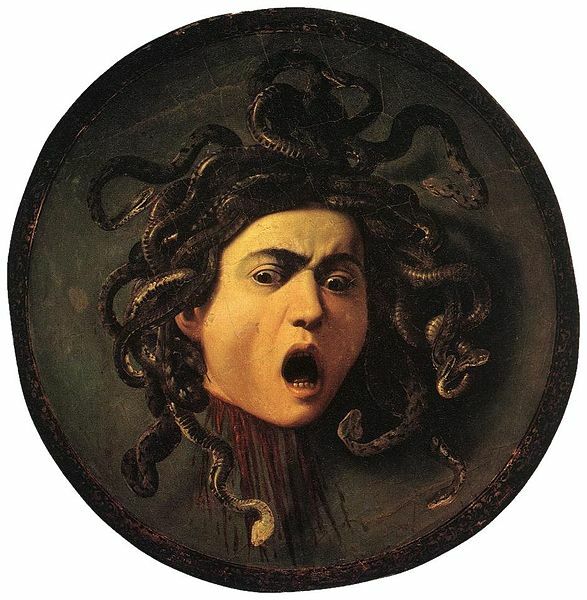 Traditional narratives and modern interpretations view the Medusa story as one of harrowing patriarchal unfairness to a hapless young girl. Viewed as Hindus see myth- as a teaching tool – it becomes a tale of redemption thru Grace after misfortune. This is not a point of view I have seen espoused as yet so I will take a shot at it. The Gods of Greek mythology were a pretty cruel bunch. Not even their own worshippers have ever seriously challenged this. Shakespeare summed up the general sentiment for all time in King Lear – “ As flies to wanton boys are we to the gods/ they kill us for their sport.” In this sorry collection of tyrants there was one admirable figure, perhaps solely by contrast. That was Pallas Athena, who was a symbol of high culture and intellect, instead of being driven entirely by crude desire as the rest of the pantheon seemed at most times. So her treatment of Medusa, who was originally a priestess in her temple, seems especially cruel and unworthy. The young girl was stunningly beautiful and had many suitors but she shunned all that for a life of service to the Goddess of the Spear, a role that required lifetime virginity. Poseidon, lord of the sea, desired Medusa and raped her in Athena’s temple. Furious at such desecration Athena punishes, not her uncle the Earth-shaker, but Medusa! She curses the poor girl to become hideous like a corpse, have snakes for hair and turn to stone anybody who looks into her eyes! This seems a toxic combination of male entitlement and victim blaming; Poseidon is excused, for virile male gods are not expected to act any different. WTF seems about the only reasonable response to this. Now classical scholars and feminists are united in their opinion that Athena seemed to always take the part of the Male values of Greek society. There is some truth in that, though opposing the Furies in their vengeance against Orestes could be seen as an intervention on the side of Law as against simple revenge. The tendency to support the values of the system that grants you power is inflamed if you are a member of a traditionally devalued group, as women in the Greek world. That has always been the charge against Athena. But the Yogic perspective offers another way to look at this whole situation. In Yoga the gods or devas are recognized as Vital Beings, super powerful it is true, but not the Godhead or Source itself. Some of them thus act in less than admirable ways. Athena has always been one of the more evolved devas so her actions in this case seem completely brutal and out of character. But the gods, no less than humans, cannot be psychologically inconsistent, so this might not be as simple as seems evident. In Indian mythology the wrath of a God is a path to salvation! Now this is weird, but if a God strikes you down then you are liberated. I propose a Hindu reading of Medusa and everything changes in meaning. Athena could not protect her priestess initially, so she later grants her power and safety beyond expectation. To become a Gorgon, to freeze men into stone, to literally petrify them, and live alone on an Island – none of this was very different from her life as a priestess to begin with. She was not to have sexual relationships then; now she is protected against any further violation. The granting of visual ugliness to women as a protection against male lust is a common theme in the bhakti stories of India. Medusa is also given power beyond belief. Any man who approaches her is petrified for his temerity. Poseidon gratified his itch, but he emasculated a generation of Greek heroes. They would go up against this unconquerable being and lose. 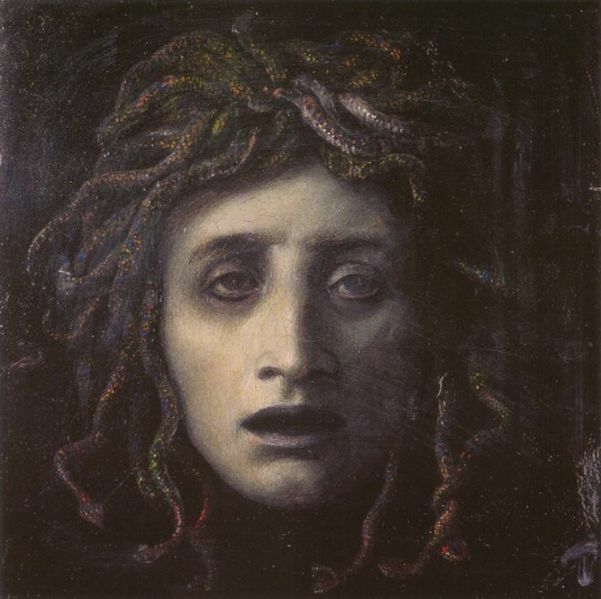 As long as Medusa lived, she was the strongest, the greatest; it must have been severe humiliation for the men. Athena made the men of Greece pay for their vanity and lust, again and again and again until she finally sanctioned a hero to liberate Medusa. That was Perseus. 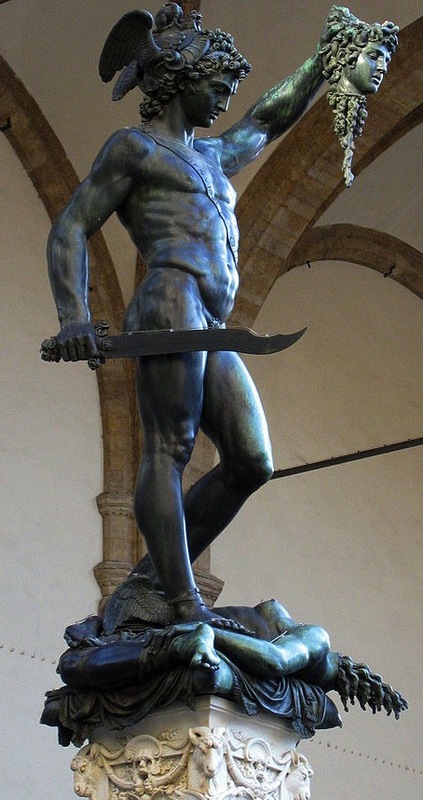 Perseus is almost unique in the Heroic Age in that he had one of the few happy endings vouchsafed to a Hero. Immortal glory normally comes to the Hero at the price of a miserable or painful conclusion to a life of suffering. But Perseus is a favorite all thru; the gods tumble over themselves to help him, to advice, to give him magical implements. The Hesperides give him a knapsack to safely hold the head of Medusa. Zeus gives him an adamantine sword, Hades a helm of darkness to turn invisible, Hermes a pair of flying sandals… it is reasonably obvious Athena was extracting this co-operation as recompense for the desecration. He sneaks up on the sleeping Medusa, viewing her face in his shiny shield, cuts off her head. He gains Pegasus the winged horse, who spurts from her blood, as a reward. Perseus uses the still potent head to freeze an unwelcome suitor to his mother and finally hands Medusa’s head to Athena, who incorporates it into her shield. Alexander the Great wore Medusa on his breastplate and she became a protector of thresholds all over the Greco-Roman world. In Hindu myth the slain foe merges into the God as an attribute of his power. Thus the elephant hide and tiger skin that Shiva wears, the rooster that is Skanda’s flag, and the mouse that is Ganapati’s vehicle, are all peculiar devotees who chose the violent path of opposition to the god and liberation by death at his/her hands. This final, and literal, seal of approval and liberation, by merging with the body or attributes of the God is a common trope of Indian myth. From a yogic teaching perspective, Medusa was a devotee who had a catastrophic misfortune owing to some negative karma, which was then rectified by the Goddess taking a personal interest in the matter. Perseus get a happy marriage, after rescuing the original damsel in distress, Andromeda. He later founds the city of Mycenae, and dies in honored old age. So there! Athena knew what she was doing.